We love sharing recipes with you so you can enjoy baking at home as much as we do ^_^. We've decided to define some baking terminologies that may be used and not well understood by some. Hope this helps you and makes baking recipes much more easier and baking fun like it should be. Incorporation of air and/or gas in bakery products by mixing, beating or whisking. Gas is introduced by baking powder or yeast. One mixing of bread or cakes. A soft completed cake or quick bread mixture. The aeration of fat, sugar, eggs and other materials. Firmness and response of the crumb or dough to pressure. Eggs beaten and brushed on bakery products before baking. To cover a cake with icing, cream, glaze or egg wash.
All the loaf except the crust. That part of the outside of the loaf that is dehydrated and caramelized during baking. 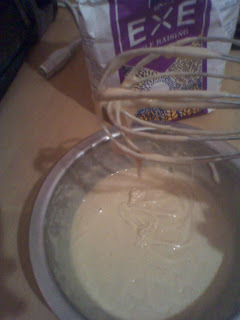 A cake mixture, which has separated and has lost its smooth consistency. To sprinkle flour on the table-top to prevent dough from sticking. Aromatic compounds used for flowering confectionery. - to egg wash before baking. - to brush with highly boiled fruit puree. - to wash with sugar solution after baking e.g. lemon drizzle glaze. Insoluble wheat protein found in foods processed from wheat and related grain species, including barley and rye. It gives elasticity to dough, helping it keep its shape and giving the final product a chewy texture. The coating and decoration of a cake with prepared butter cream icing or frosting. The decoration on the edge of a short bread, pastry etc. The calculated units from the total baked weight of a particular formula.